Do you need to maximise your reach to new customers, but keep marketing costs down? Perhaps you have a new service or offer to promote, or you simply want to create more business leads. If so, a leaflet could be the perfect marketing solution. Print is anything but dead. On the contrary, print media still has a higher perceived value than digital media and its tangibility means it has a much longer shelf life. As such, you’ll find that leaflets are not only eye-catching, but a great way to explain a specific product, service or offer. By their very nature leaflets are also super direct – literally landing right on your potential customers’ doorstep! Inexpensive to produce and distribute, leaflets are the ideal marketing material for small businesses with local, or geographically specific, target customers. But the key to exploiting the full potential of leaflets – and ultimately generating sales for your business – lies in filling them with the right words. Of course, conjuring up a brilliant leaflet can be hard when marketing is not your core area of expertise, yet you may not have the budget to outsource the job to an agency or a professional copywriter. You see, there’s another, far more economical way to get help – right now! I’ve condensed my many years of copywriting experience into a step by step, 44-page printed workbook that takes you through the whole process of writing compelling content for your leaflets. How to Write A Leaflet That Sells is your DIY guide to creating engaging copy that results in a truly effective marketing leaflet. At just £35 (+£3 P&P), this kit could save you hours of work because it will channel your thinking very carefully, before you even set pen to paper (or the digital equivalent!). In fact, this comprehensive kit not only explains how to write a compelling leaflet, it provides a mine of helpful tips about how to write the right words for your business generally too. Using a series of Action Pads, I’ll take you through the practical process of how to shape your thinking so that you become clear about what you need to say to entice your target customer to take action. The kit even provides an easy to use leaflet template, and editing advice so that you can polish your leaflet so it shines! 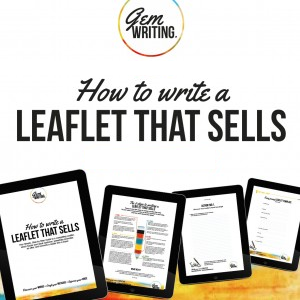 In fact, this comprehensive guide can help you write your own compelling leaflet copy – without having to pay a professional to do it for you. Still unsure? Perhaps you’ve used leaflets in the past without success? This doesn’t mean to say the tactic of using leaflets can’t work for your business, but it does mean to say that a leaflet needs to be spot on. And remember to include a clear and specific call to action to ensure your reader knows exactly what they need to take advantage of your offer. Remember, everything needs to be obvious. If you want the customer to call, you need to ask! Ok, so these are some top-line tips, but, as you can imagine, there’s a process to go through before you even get to the point where you can think about headlines and text details. The kit will help you every step of the way. Let me remove the headache of starting your leaflet from scratch! Invest in your DIY leaflet writing kit today and I promise it will help you create an effective marketing tool. Not only that it will be an enjoyable process too! To get started, just check out with Paypal using the ‘buy now’ button below and I’ll get your copy sent to you by first class post. 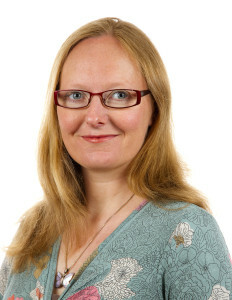 My new business, www.mybusinesshq.co.uk, has just launched and we want a really compelling leaflet that stands out to promote it… now I have the perfect tool, a step by step process and brilliant workbook. Thank you so much. I thought the guide was well laid out, making it user friendly for people who are new to leaflet writing and time short, as so many of us working in our own small businesses are. A step-by-step approach is great as it provides you will a bit of a ‘checklist’, especially relevant for people new to the whole idea of marketing in this way. I love the space to take notes, answer questions and consider how to use it in my own business too. I will certainly be referring to the guide as we write and design our own leaflets for marketing campaigns.